China is promoting an unmanned reconnaissance / combat helicopter in the international market, further expanding the scope of its military drones offered to foreign buyers. Aviation Industry Corp of China, the State-owned aircraft giant, has put its AV500W unmanned autonomous helicopter on display at the fourth China Helicopter Expo that opened on Thursday in Tianjin. The 7.2-meter-long aircraft, developed and produced at the AVIC Helicopter Research and Development Institute in Jingdezhen, Jiangxi province, has a maximum takeoff weight of 450 kilograms, a maximum speed of 170 kilometers per hour and a flight ceiling of 4,000 meters, according to the institute. The helicopter is capable of carrying 120 kg of weapons and equipment. Its reconnaissance version can remain aloft for eight hours while the reconnaissance/combat model is able to fly four hours. 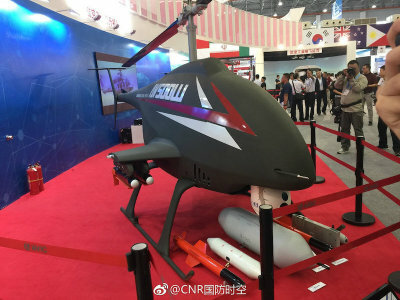 All of the military drones China has offered to the international market have been fixed-wing models, making the AV500W the first Chinese unmanned military helicopter available in that market, observers said. An armed AV500W typically carries four air-to-ground missiles, which use radar homing technology for guidance. Each missile weighs 8 kg and can hit a target 5 km away, the institute said. It also can carry bombs or a machine-gun pod. The helicopter features good mobility, penetration capability and a high level of automation and has a stealth design. A typical mission would be a precision attack on light-duty armored vehicles and personnel, the institute said. Jiang Taiyu, one of the chief designers of AV500W, said the aircraft fired weapons during its maiden flight test in August. "The helicopter is able to take off and land on almost any landform including plateaus and canyons. It can operate in cold and tropical environments. It will be useful in border patrols, counterterrorism operations and low-intensity conflicts because it can carry out very-low-altitude penetration and keep hovering for a while," he said. The designer added that all of the helicopter's tests will be finished before the end of this year and it will be ready for mass-production in 2018. "Several nations have told us that they are interested in this aircraft. This is because there are a very small number of unmanned helicopters in the world that can perform strikes, while demand for such types is not small," Jiang said. He said only the United States and Israel have developed unmanned armed helicopters, such as the Northrop Grumman MQ-8B Fire Scout in the US. The AV500W's target market will be countries dealing with terrorism such as in the Middle East, he said. Fang Yonghong, director of unmanned aircraft technology at AVIC Helicopter Research and Development Institute, said many nations in Europe, Africa and the Middle East face huge pressure to ramp up their counterterrorism efforts, so they need good, affordable equipment such as the AV500W. More than 400 helicopter producers and parts suppliers from 22 nations and regions — such as the US, Russia and France — are taking part in the helicopter expo, the largest of its kind in China. They brought 98 aircraft to the event. Helicopters from the People's Liberation Army Ground Force and AVIC conducted flight demonstrations at the opening ceremony on Thursday morning.